It wasn’t until the 1970s that women’s artwork began to receive the meaningful attention of curators and critics. There’s more equity in the 21st-century art world, but redressing cultural imbalances has taken more than a generation. That’s why a contemporary show such as “Women’s Work: The Visual Art of Vermont’s Women,” currently on view at Montpelier’s T.W. Wood Gallery, is still vital. Other than its existence, however, there is nothing distinctly feminist about the exhibition. Painting is the dominant medium, with a few notable exceptions. “Magnificent Red Tailed Sitter” is a pedestal sculpture of abaca paper (a banana-plant fiber) by Grand Isle artist Riki Moss. The left side of the curious, biomorphic abstraction is a mask-like face, while a fat, red, tubular form twists around at right. Moss’ skinny, awkward-looking “Large Confusion” is a 5-foot-tall, freestanding object constructed of the same rough and frayed paper. Despite their lightweight medium, these paper sculptures are sturdy and appear heavier than they probably are. In central Vermont artist Barbara Scotch’s aluminum print “Dreaming Of…” two sepia-toned geometric shapes float over a mottled gray background. The organic, cellular forms resemble highly magnified pods. Marie LaPré Grabon’s charcoal drawing of a seated, clothed male figure has obvious Matissian influences, but the Hardwick artist’s lines and planes are completely original. Weights are expertly varied in her charcoal lines, and the composition is lively. Straight and curved lines are organized to impart movement to the figure, while patches of light and dark deepen the space. “Summer Blooms” by Harriet Wood of Marshfield is a 36-by-42-inch oil on canvas. 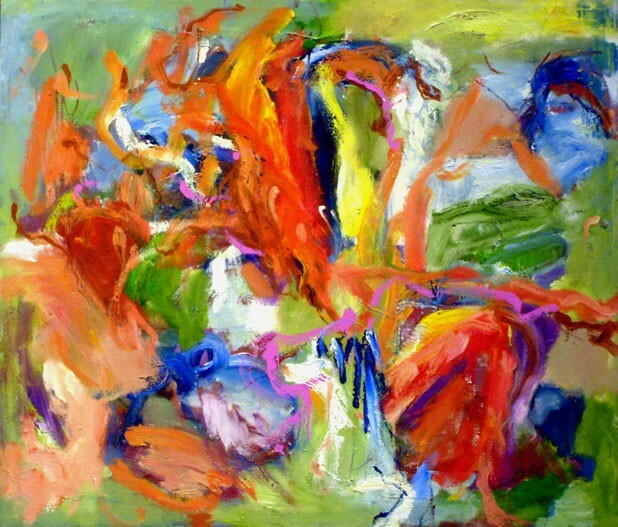 The bold, abstract-expressionist composition features active brushwork. Varied doses of harmonious hues lend a subtle order to the piece, such as patches of green that anchor the fiery central fields of red and orange. Among the paintings in “Women’s Work” are several large triptychs and other multipanel pieces. Middlesex artist Galen Cheney presents a three-panel, oil-and-enamel piece titled “The Express.” The left and center panels are each 44 by 32 inches, while the right is 44 by 24. That lopsidedness suits Cheney’s theme and gives the piece a strong left-to-right movement. The nonobjective abstraction is almost like subway graffiti, with twisting shapes and patches of dripping color. Sally Linder’s large acrylic triptych is more formal and controlled. “Homage to Shostakovich Opus 110” was apparently inspired by a string quartet in C minor by the Russian composer. The 56-by-126-inch work is dense with agitated brushwork in a tightly woven picture plane of yellows, rust and layers of blue. It seems like an abstract tangle of storms, ribbons and textures. The Burlington painter’s composition is expansive, its values bright. “Otter Creek” by Janet Fredericks of Lincoln is a small diptych of two 15-by-15-inch surfaces paired horizontally. The detailed, rhythmic ink drawing suggests an Albrecht Dürer version of a creek, with small currents wrapping around and over the main stream. Figurative paintings, too, appear among the hundred artworks of this exhibit. Janet McKenzie’s “Ivori” is a 48-by-35-inch canvas in which two figures stare out from the artist’s signature stained-glass-like space. The Northeast Kingdom painter’s figures typically have an otherworldly look, and in this piece they wear geometric cloaks. One figure is looking at the viewer; the other seems to be in prayer. In Vermont, women curate many of the most important venues and can be counted among the state’s most successful visual artists. Despite the current status quo, progress is not guaranteed and should not be taken for granted. Viewers might do well to take their sons as well as daughters to this show.